I've been looking forward to this cover for quite a while! 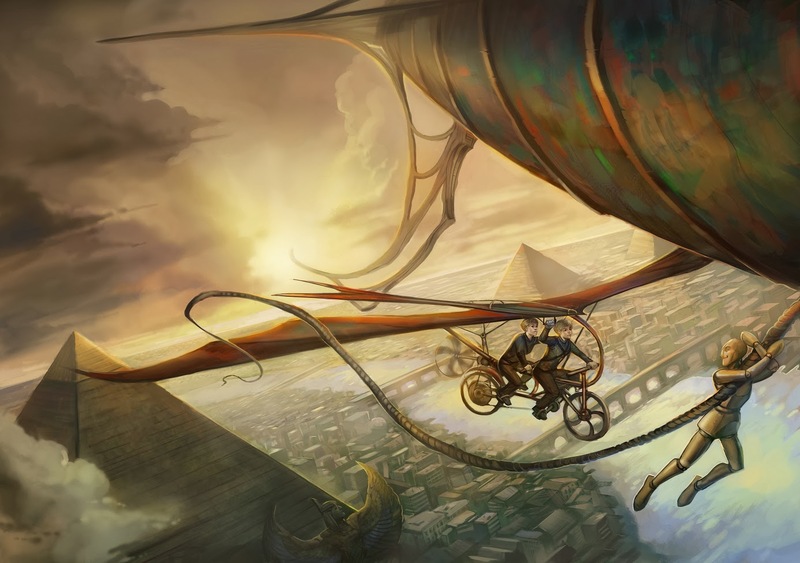 Another gorgeous Julie Dillon piece that I'm totally going to have to have as a print on my wall. In a world where lightning sustained the Roman Empire, and Egypt's vampiric god-kings spread their influence through medicine and good weather, tiny Prytennia's fortunes are rising with the ships that have made her undisputed ruler of the air. But the peace of recent decades is under threat. Rome's automaton-driven wealth is waning along with the supply of their power crystals, while Sweden uses fear of Rome to add to her Protectorates. And Prytennia is under attack from the wind itself. Relentless daily attacks destroy crops, buildings, and lives, and neither the weather vampires nor Prytennia's Trifold Goddess have been able to find a way to stop them. Nothing could convince the Tenning children, or Aedric's sister Arianne, that the deaths were anything but murder. They will stop at nothing to uncover what really happened. Here's the full image. It's my first wrap-around cover (which I wanted because I wanted that sweep of city with the pyramids rising above it). The genre of this one is going to be super tricky and I imagine a lot of people will pick it up thinking it's one thing and find it's another. A lot of my books feature both adult and child POV characters, and this is no exception, swapping between Eluned (at the front in the picture) who is fifteen, and Arianne, who is in her thirties. I don't consider it YA because it doesn't involve moving from childhood to adulthood in any particular way. It's also not Steampunk, in that it's not a Victorian setting, and does not use Victorian clothing or social mores, but the tech level is similar. It's both fantasy and science fiction, since the main plot of the series revolves around awakened gods and scientific change. It is certainly alt-world, in that it started with our world and then had increasing points of divergence - and it's involving such an enormous amount of research, even if all I can research is the starting points before the divergence - so I'm going to think of it as alt world kitchen sink. 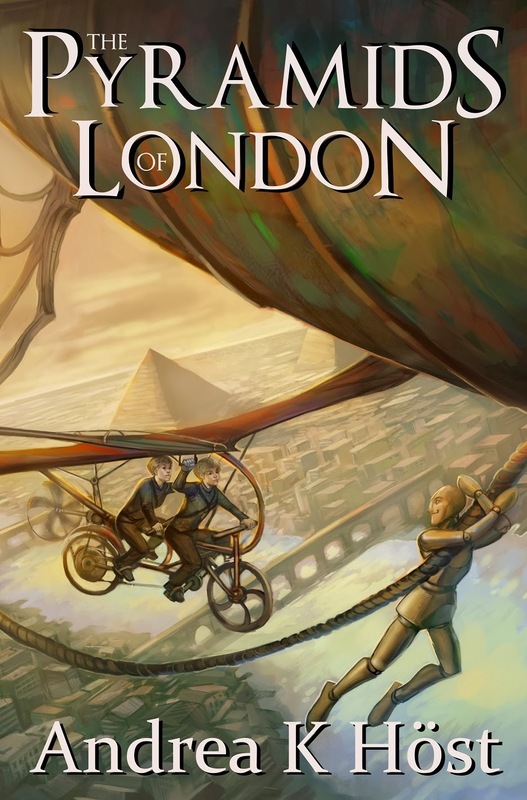 The release date will maybe be at the end of this year (all that research is slowing me down, although I'm collecting some lovely books like one which is maps of London through history). If not this year, then early next year. It's very hard to tell since I'll be overseas from August - November and expect that will impact my output rather significantly! I agree. That is a beautiful cover. I am persuading myself to become a disciple of the great triumvirate: great story, great blurb, great cover. This cover piques my interest, makes me want to read the blurb and see inside. That is the purpose of a cover, and yours has served that purpose admirably. Not only is that cover quite awesome, the blurb very much makes me want to read the book. Looking forward to its eventual appearance! Great cover! And that blurb sounds awesome. Another beautiful cover - and just by the way I love the font and layout as well. Is the text the back-cover/sales-page blurb? Very hooky! Yep, the text is the blurb as currently drafted. This is a beautiful cover! I love the detail. Can't wait for the book either. Was wondering if you could share the name of that book of London maps and any other research books you enjoyed. Btw I can't wait to read this. "London: A History in Map" by Peter Barber. I just finished a self-published book about Hatshepsut's tomb. Not the slickest production I've ever come across, but the passion for the subject shone through brightly.